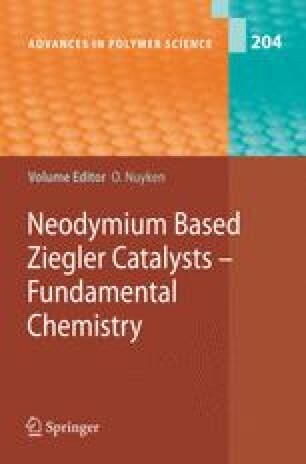 This article reviews the polymerization of dienes by neodymium (Nd) based Ziegler/Natta-catalyst systems. Special attention is paid to the monomer 1,3-butadiene (BD). The review covers scientific as well as patent literature which was published during the last decade to 2005. For a better understanding of the recent developments the early work on lanthanide-catalyzed diene polymerization is also addressed. The most important product obtained by Nd catalysis, butadiene rubber (Nd-BR) is introduced from an industrial as well as from a material scientist's point of view. Strong attention is paid to the great variety of Ziegler/Natta type Nd-catalyst systems which are often referred to as binary, ternary and quaternary systems. Different Nd-precursors, cocatalysts, halide donors and other additives are reviewed in detail. Technological aspects such as solvents, catalyst addition order, catalyst preformation, polymerization temperature, molar mass control, post-polymerization modifications etc., are presented. A considerable part of this review discusses variations of the molar ratios of the catalyst components and their influence on the polymerization characteristics. Non-established polymerization technologies such as polymerization in bulk, slurry and gas phase as well as the homopolymerization in the presence of other monomers are addressed. Also the copolymerizations of butadiene with isoprene, styrene and alkenes are reviewed. Mechanistic aspects such as formation of the active catalyst species, the living character of the polymerization, mode of monomer insertion, and molar mass control reactions are also explained. In the summary Nd technology is evaluated in comparison with other established technologies for the production of high cis-1,4-BR. Unsolved and open questions about Nd-catalyzed diene polymerization are also presented. The authors thank Prof. Dr. Wieder, Dr. U. Wolf, Dr. H. Kloppenburg and Dr. S. Mücke for valuable advice and suggestions and J. C. Sauceda and D. E. Herbert for checking the manuscript. L. F. thanks Bayer AG for financial support during his diploma and Ph.D. thesis. L. F. also gratefully acknowledges a Postdoctoral Fellowship granted by the German Academic Exchange Service (Deutscher Akademischer Austauschdienst DAAD). L. F. thanks Prof. I. Manners for excellent working conditions in his group. http://www.iisrp.com (accessed on Jan/19/2006); IISRP (2002) Worldwide Rubber Statistics.